Keywords: Salvador, Maceio, Foz do Iguaçu in Parana state. Country border Uruguay and Argentina. The greatest South-American country with its charming cities and beautiful beaches. The capital is the modern Brasília. 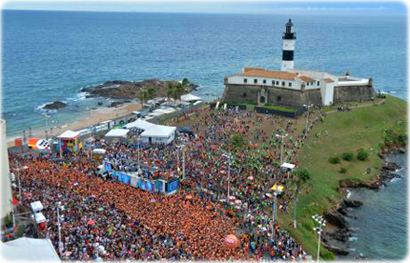 The biggest carnival of Planet Earth, with the participation of more than two million people in the city of Salvador. In the background, the Farol da Barra, the first lighthouse in America.